Terry Serio is a well-known actor and a musician. ‘I have been getting to know Terry over the last couple of years since my boyfriend Simon Relf started a band with him called Oh Reach,’ says Clara Adolphs. ‘Terry is a commanding and intriguing presence on stage. He also has an amazing face. ‘I don’t often paint from life. My usual practice and interest lie in abandoned old photographs. 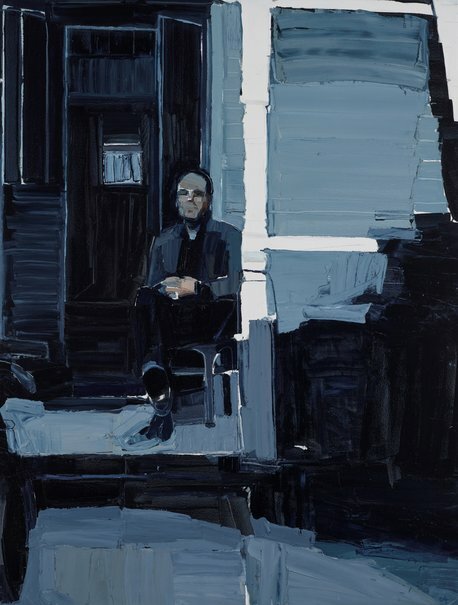 I liked the idea that Terry was an actor and that, together, we could create a scene for a painting, like one of the photographs I often use as a reference. I had him sit for me on the front porch of his beautiful old home, with his motorbike in the front yard. Born in Sydney in 1985, Adolphs has a Bachelor of Fine Art from the College of Fine Arts, University of New South Wales. She won the 2012 Young Emerging Artist Award at the Mosman Art Prize. She is a three-time finalist in both the Portia Geach Memorial Award and the Brett Whiteley Travelling Art Fellowship. This is her first time in the Archibald Prize.